The really sad part of the story found below is that even with all of the technology in place these days, society is digressing. Sure we have laws to protect and keep some sort of order, put what about those who find themselves in situations that society - "Haves" & "Have-more" - DICTATE their existence. More people have met with harm by the "Haves" &/or "Have-more", than by those living rough on the streets, under bridges, in wooden areas and/or anywhere they can. To Jay Casey, please get out of your so called "safe zone" for more than charity benefits, for a "feel good" feeling for ones self and/or for organizations that have seem to find ways to make profitable businesses out of those of us who find ourselves as being "The Houseless". Then maybe, yes just maybe, your misguided fears would meet reality! You can only shove humans out of existence so far before one day what society has created will need ALL of those who actually seek a more amicable existence, to become real and be about it. 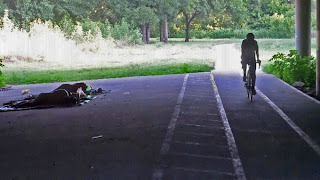 DALLAS — Over the last few months, homeless camps had almost become a fixture along the stretch of White Rock Creek Trail that passes under Skillman Street, north of White Rock Lake. Men were sleeping within just a few feet of one of the city's most popular jogging and biking trails. The campers included 43-year-old Michael Eubanks and a buddy of his named Charlie. Eubanks said a City of Dallas employee came through on Tuesday morning and told them to leave. "Man, a dude drove by in a Parks and Recreation truck and said, 'Hey, if y'all don't move, the police are gonna come and make y'all move.'" So they moved. And they weren't alone. 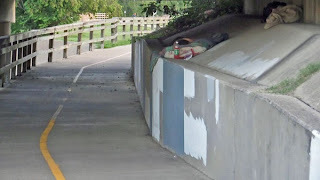 Pictures snapped along the trail Tuesday morning showed another homeless camp under another bridge just a little further north. Some homeless people in Dallas have found a place to camp out along White Rock Creek Trail. "There's kids out here, and if you're trying to run early in the morning, I have concern for my wife and other people out here," said Jay Casey, as he jogged on the trail training for an Ironman Triathlon. "But I know they need a place to stay, and we've gotta do something to help them." Some homeless are hard to help, and Michael Eubanks may be one of them. He's been in and out of prison, struggles with his temper, and he likes to drink. He and Charlie lost their apartment, then chose to live on the trail, under the Skillman bridge for the last couple of months, saying shelters aren't for them. "I know how it feels to be institutionalized, and for me — in shelters — I feel like I'm closed in, boxed in," Eubanks said. "I like being free and open." 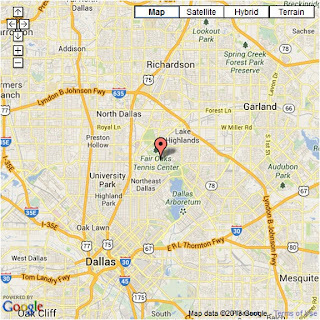 Shelters in Dallas are reporting increased demand over the last few months, mostly from veterans and women with children. One shelter reports an 18 percent increase over demand from two years ago. Mike Faenza, President and CEO of the Metro Dallas Homeless Alliance, said the city has made great strides, reducing chronic homelessness by 66 percent since 2004. He said there is still room to grow, but concedes it's a struggle to deal with people like Eubanks. "There are people choosing to live outside, and, for the most part, those people would not be there if it weren't for issues of alcoholism and addiction," Faenza said. Eubanks showed us around the camp he cleaned up after the city asked him to move, showing where he stashed his blankets and where he and Charlie slept. "I like being open and free," he reiterated. He also wondered what prompted the order from the parks department. "Ain't nobody bother me, and we don't bother nobody," Eubanks said. "We eat our food, we drink our beer. You know what I'm saying? What are we harming? I don't understand that." "We're gonna find us another spot," he pledged,saying it won't be in a shelter. He was thinking they may try the other side of the same bridge. "I ain't bothering you," Eubanks said. "Leave me alone; let me eat my food and drink my beer. I just wanna go to sleep."